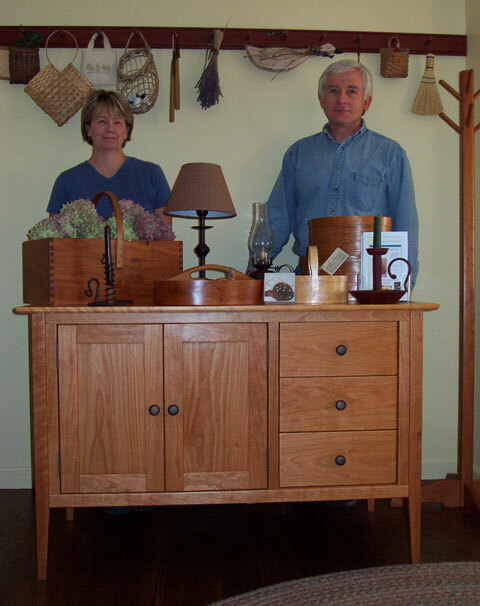 Together they established Meadowbrook Creations, their ‘make to order’ furniture business specializing in Shaker inspired pieces, all designed by Sonny and Lynne. The ability to combine their web-site development skills with their love of woodworking has allowed the Brides to build a business that has delivered their handcrafted furniture into homes in every state of the continental US. They now have some of the best craftsmen in the country building their furniture. Meadowbrook Creations bathroom pieces, which include vanities, linen towers, medicine cabinets and mirrors, is now the main stay of the business. They attribute much of the success of their bathroom business to the free design service they offer their customers. There is no retail store or showroom as they build to order and ship/deliver everything as soon as it’s built. They have been very fortunate in the fourteen years they have been in business and have always been so busy that there has never been the time or the need for a retail store or a showroom. Their workmanship is guaranteed 100%. Meadowbrook Creations products grace homes in every state in the U.S. including Alaska and Hawaii; also Canada, Jamaica, England, Germany, Belgium, and France. And they have many, many repeat customers. They are a member of the Better Business Bureau with an A+ record, and are proud to have the highest rating that the BBB gives! They have been recognized by the Better Business Bureau as having earned and achieved a perfect record. You are in safe, quality hands with Meadowbrook Creations.